I love salsa! Not only is it low calorie and good for you, it is also great with baked chips (super yum! ), on quesadillas, soft tacos, eggs, etc. There are really countless ways to incorporate salsa into your meals and snacks. So, you might ask, why exactly is salsa good for you? Well not only is it naturally low in calories, cholesterol, and fat, it contains a number of healthy vitamins and minerals such as vitamins A and C, calcium, and potassium. Additionally, tomatoes contain lycopene which is thought to help prevent cancer and heart disease. Also, garlic contains allicin which is believed to lower cholesterol and blood pressure. So, now that you know about some of its health benefits, you might be wondering which salsa is actually the yummiest. Well, in a personal quest to find the perfect salsa, I tried making my own salsa several times, but unfortunately, I never created a salsa that I really loved. 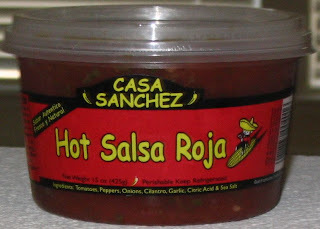 Then, I discovered a really yummy homemade-like salsa at a friend's bbq that turned out to be Casa Sanchez' Salsa Roja. I was really pleased when I learned that Casa Sanchez contains all natural ingredients (just vegetables and seasonings). I absolutely love the Hot version, since it is just hot enough to be tasty and interesting, without being overwhelmingly spicy like some salsas (you know, the ones that make your eyes water, which is never fun). Now, I know not everyone likes spice, so I did want to mention that Casa Sanchez does make some tasty, less-spicy varieties as well. One of the *best* to remember about salsa is that it is incredibly low calorie, which means adding it to your food is always an option! In the case of Casa Sanchez, 2 tablespoons of salsa is only 10 calories, or 0 WW points. You could even eat 2 servings for 0 WW points if you wanted. When I'm feeling really adventurous, I sometimes combine a serving of salsa with a serving or half-serving of fat-free sour cream as a super yummy addition to my eggs, quesadilla, or other foods. I usually buy Casa Sanchez at Whole Foods where ironically it is less expensive than at our Safeway. But it is available at both, and generally available at most grocery stores in the refrigerated section. So, what is your favorite salsa? www.salsaranchera.com. Talk about home made,it's home made! So find it,taste it,and have a fiesta for your "Buds". It's also Award Winning! Looks interesting, but unfortunately, only available in Arizona. My favorite salsa is Salpica Cilantro Green Olive Salsa. It is really yummy and fresh tasting. I can only find the mild variety, but I would love to try it hotter! My favorite is Herdez. It is so authentic!